Now you can OWN the urban bicycle of your dreams. “Bike Share”: It’s a hot new development in cycling. Cities all around the USA, Canada and Europe are signing on. Racks of bicycles stand on street corners in Paris – Montreal – Boston – Washington, DC. But let’s face it, “Bike Share” – really rental -- is heavily subsidized with kiosks on public property -- and naming rights sold to corporate sponsors. In Boston, it’s New Balance athletic shoes. New Balance doesn’t even make cycling shoes! Bicycles in shackles! On public property! Un-American colors: green, grey and black! What are hard-working local bicycle dealers to do when the City places a rental kiosk in front of their stores? What advantage is there to bicycling if YOU have to walk at both ends of your trip, and wait in line to swipe a credit card in what looks for all the world like a gas station pump? What if all the bicycles have been rented out! This isn’t Personal Transportation, this is mass transit, with all the headaches, and sweat too! What if they are tracking your every move by GPS? While we stand proud against this evil exploitation, we only sympathize with the bicycles themselves. They deserve better, with their rugged aluminum step-through frames, integral luggage racks, sturdy 36-spoke wheels. Wide, forgiving tires. Trouble-free three-speed hubs; fenders, disc brakes; generator-powered LED lights… But bicycles should not have to stand around on street corners soliciting business like drug dealers or ladies of the night! These bicycles are being trafficked – in every sense of the word. Left: Pay station: Pump -- or Pimp??? Below: bicycle with its back end rakishly tilted to solicit business. Shocking! Now, ShelBroCo puts the weight of its reputation and influence behind the first attempt of its kind to restore the American Way to bicycling. Every bicycle deserves a loving home. Through a unique arrangement with a major metals recycler, ShelBroCo now is able to liberate a growing number of these fine bicycles and offer them to private owners -- to YOU! 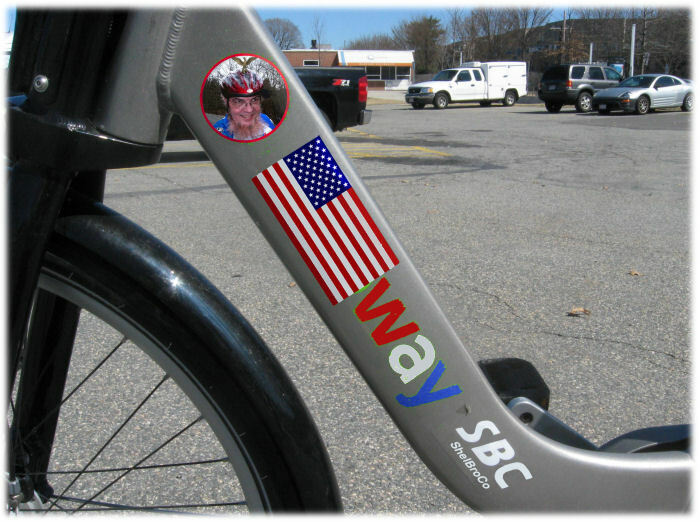 Each rescued ShelBroCo American Way Bicycle is decommissioned, and its serial number registered in an online database so there is never a question of unauthorized use. Any electronic surveillance device which might send information back to the bicycle’s former masters is removed, or reprogrammed. We take your personal freedom very seriously! Rescued, refurbished and proudly rebranded! This is your golden opportunity to stand up for the principles that make America great! Here in the Land of the Free, no attempt to replace Private Enterprise and Private Ownership with a Euro-tainted collectivist model can stand unchallenged! Don’t miss your opportunity to own a top-quality urban bicycle, and to fend off the shackles of Socialist oppression. Sign up now! I’m willing to challenge any of these gentlemen up here to a 25-mile bike ride any time of day in the heat of Texas. I’m going to get one for each of my 7 children! Access to -- bicycles is an American right, but we will, uh, devolve responsibility to the private sector. It is a great idea in Boston, but Obamabikes lays dirty tire tracks across the map of our great nation. Detractors – with foes like this, we know we must be Right! Would you willingly ride a bicycle that had recently been used by dozens of other people who are, as likely as not, unwashed, unhelmeted, unskilled and uncaring? With gasoline at $2.50 per gallon, who will need bicycles anyway? I mean, fly me to the Moon! ¡No sólo las bicicletas estarán libres quando expulsaremos a la burguesía! Other national versions also available on special order:: française, Canadien/canadienne.... ASK! or select a recent contact Scott Walker Hosni Mubarak Bernie Madoff IRS Sarah Palin Bill Gates Steve Jobs John Edwards Sheldon! USD(equals $0.00 USD) . . .Click Continue to view the converted amount. Choose an option under Purchase to pay for goods or services. For any other transaction, choose a Personal option. If you prefer to pay on PayPal, click here.